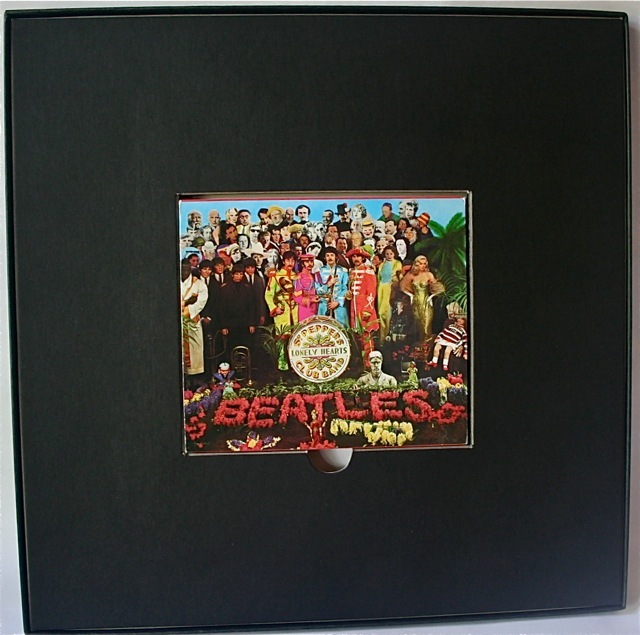 When the Beatles catalogue came out on Compact Disc for the first time back in 1987 it was a very big deal and the British record store chain HMV (which has close ties back to the Beatles record company EMI) released a series of limited edition 12” x 12″ box sets to mark the occasion. These boxes look just like those which contain 12″ LP’s so I guess there was a certain symbolism in releasing them in this way – the boxes containing CD’s indicating a move forward from the LP to the Compact Disc. In all there were 12 individual box sets containing either individual or grouped CD’s, plus there was also a large (and expensive) HMV box housing every Beatle CD title then available. You can see here all the “Beatles on CD” HMV Box Sets (minus “Abbey Road”) above. These (except for the 1962-1966 and 1967-1970 sets) all came out in 1987. 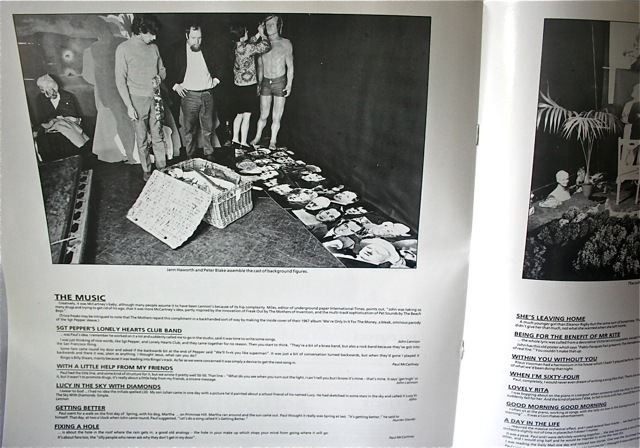 The box numbered BEACD25 contained “Please Please Me”, “With The Beatles”, “Hard Days Night” and “For Sale” on CD, plus a 224-page book ‘The Book Of Beatle Lists’, plus a Beatles fact sheet. 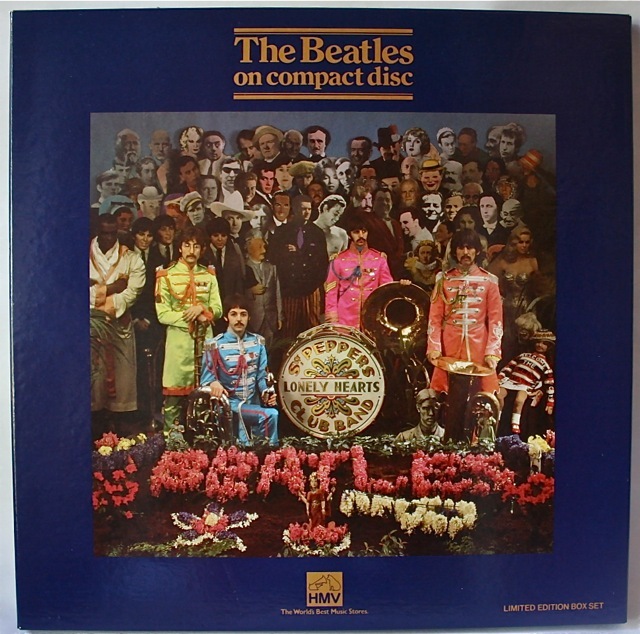 BEACD25/2 contained “Help”, “Rubber Soul” and “Revolver”, plus a reprint of Beatles Monthly No. 12 and a Beatles fact sheet. 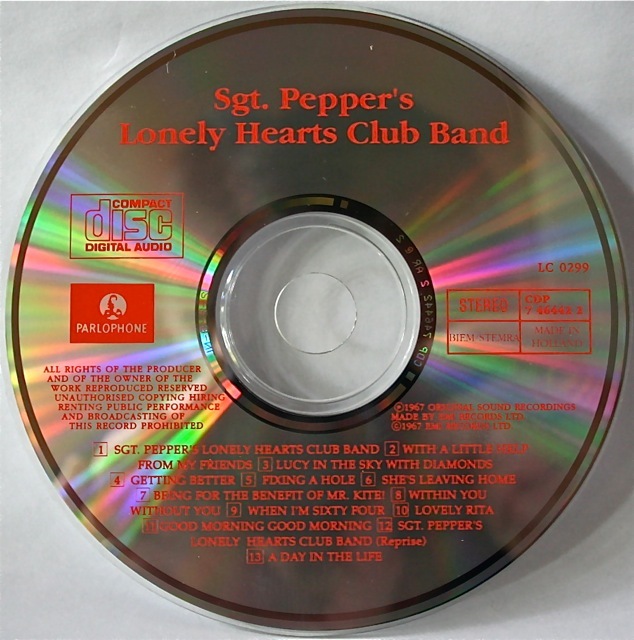 “Sgt Peppers Lonely Hearts Club Band” (BEACD25/3) had the album with a slipcase, an 8-page ‘behind the scenes’ booklet, the 12″ cut-outs sheet and a badge. 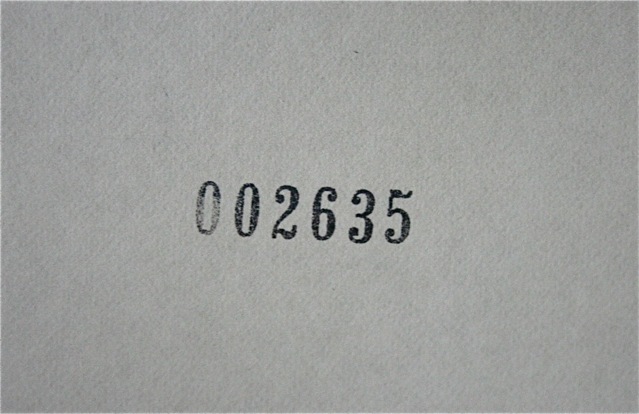 The “White Album” (BEACD25/4) featured an individually numbered double CD album, a 12-page glossy booklet and a badge. 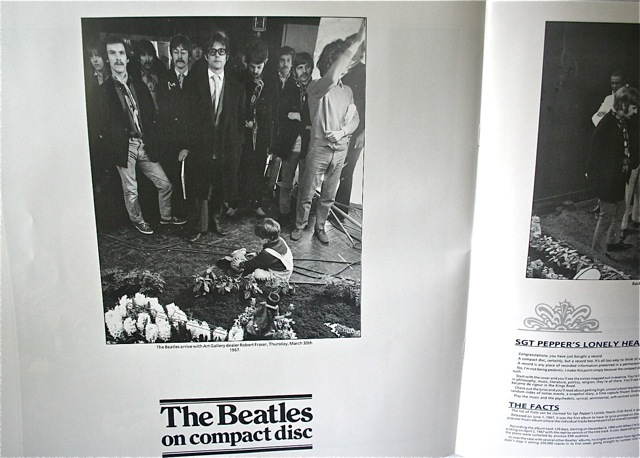 BEACD25/5 was “Yellow Submarine” and came with an insert, a cut-out ‘Yellow Submarine’ model, and a fact-sheet, while “Magical Mystery Tour” (BEACD25/6) had a 12-page booklet, a large fold out colour poster and badge. “Abbey Road” (BEACD25/7) comprised the 17-track CD album, two different posters, a badge and an 8-page booklet. 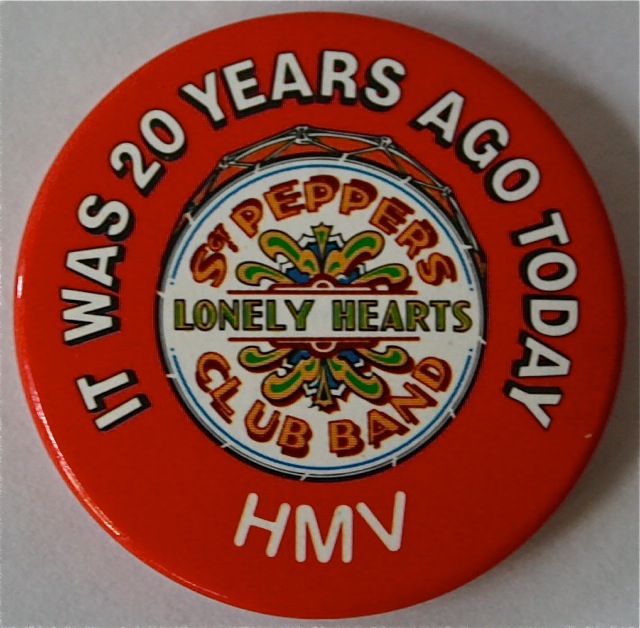 The “Let It Be” HMV box has a 12-page booklet and badge, and has the catalogue number BEACD25/8. The “Past Masters Vol.1” and “Vol. 2” came in separate boxes – each with a badge and a 12-page booklet with pictures and track-by-track details. These were numbered BEACD25/9 and BEACD25/10. 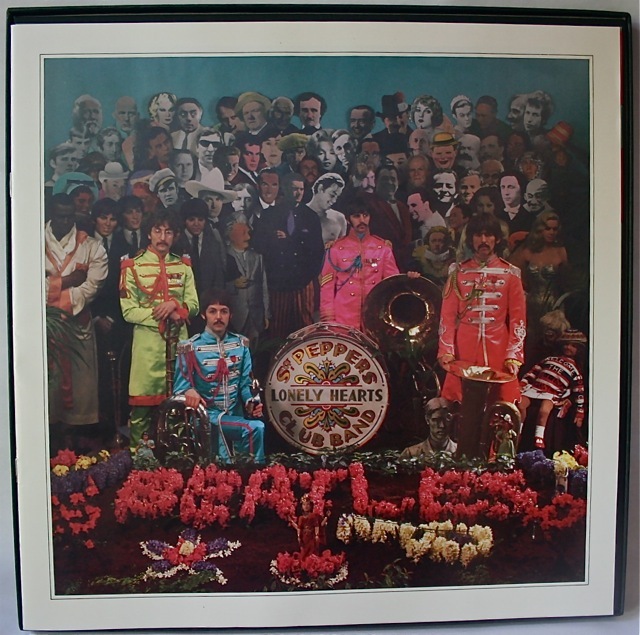 Finally, when they were released in 1993 the “Beatles 1962-1966” Red Album and the “Beatles 1967-1970″ Blue Album also came in separate boxes containing the double CD sets, a 12-page colour booklet featuring song reviews, a 16″ x 24” colour poster and a badge. These were numbered BEACD25/11 and BEACD25/12 respectively. I got a bargain the other day – I was able to get the “Sgt Pepper” HMV box and the “Beatles 1962 – 1966” – both practically mint copies. 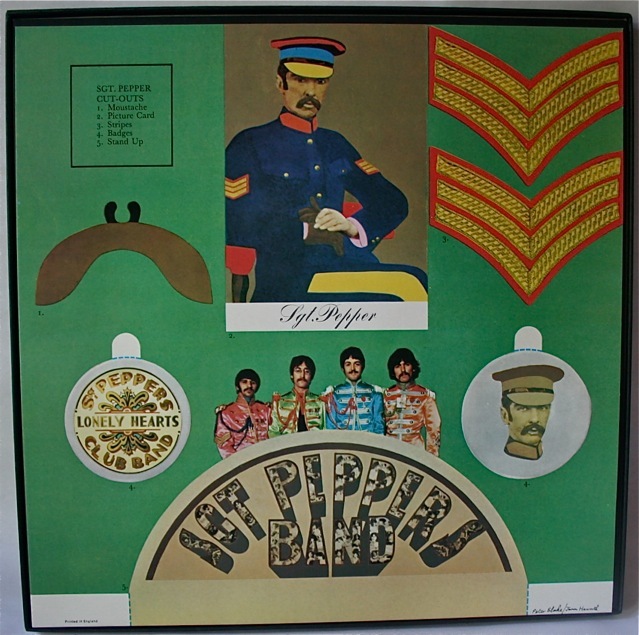 I’ll give you a close up look at the “Sgt Pepper” box set here, and post on the “62-66” red box next time. Next post we’ll take a look at the “Beatles 1962-1966” HMV Limited Edition box set. This entry was posted in Beatles Collecting, Beatles Music, Beatles Related, John Lennon, Paul McCartney, Rare Beatles, Ringo Starr and tagged Beatles, Beatles Collecting, Beatles HMV box sets, George Harrison, John Lennon, Paul McCartney, Rare Beatles, Ringo Starr, Sgt. Pepper by beatlesblogger. Bookmark the permalink. Thank you for telling me exactly what it was I missed out on due to the extreme high price these commanded back then. It is worth noting that the Abbey Road box featured an alternate cover picture which was also one of the included posters. Anyway, thanks for the effort this took. It is valuable info. I have a unique collection of boxed set editions that were acquired from a contact at HMV – All boxed sets are numbered 00005 – apparently lower numbered issues 00001 – 00004 went to surviving Beatles or their families ? I have no proof of that – only what I was told. I personally do not doubt the information , but maybe someone knows otherwise? Thanks for your question. I don’t have any info at all on the numbers issued for each limited edition title. It would be interesting to know – so if anyone has the details please let us all know. Those sets with the 00005 numbers sound fantastic. They’d really be worth a lot and great to have in any collection. Thank you for passing on that that information. Really helpful. Cheers. I have a complete set (all 12 box sets) and 2 of them are numbered over 10,000 (Sgt. Pepper at 010878 and the red 1962-1966 at 12379). All the others fall within the range you mentioned. I just put them all together (now) up for sale on eBay. All the best! That’s a bit odd because the sources I’ve checked on say that Sgt Pepper had only 10,000 copies printed – but clearly yours is over that mark! The red 1962-1966 (and the blue 1967-1970) are both listed as having 15,000 copies, so I guess that makes sense. Can you send through a link to your Ebay listing? I had the pleasure to meet and become friends with the late CEO of HMV – Mr Stuart McAllister who was something of a musician himself and had a sixties band based in Essex called Lee Scott & The Roulettes. He realised what a collector I was and although I had some of the 1987 box sets, He kindly gave me the whole set from his collection all numbered 00005. They are my most treasured items that I have and I believe HMV presented the Beatles, or their surviving partners, with the first 4 of each edition. The first box is the most elusive to track down. Known as the Black Box, it contained the first four albums by the Beatles (all in mono! ): Please Please Me, With the Beatles, Hard Days Night, and Beatles for Sale. It was released on February 26th, 1987 and was limited to just 2,500 copies, and it sold for £49.99 which was a small fortune back then. Following the Black Box came the Red Box which was released on April 30th, 1987 and contained three albums: Help, Rubber Soul, and Revolver. They were all in stereo this time and only 5,000 copies were made. Hi Dave, Thank you so much for sending this information through. Stuart McAllister must have been a very generous person. And to think- having the entire set and numbered 00005! The release number figures you have provided clear up a number of questions for us about how many of each set was released. Clearly Sgt Pepper was 12,500, not 10,000 as previously indicated. An Abbey Road was not 12,500 but 10,000. Thanks again for giving us this story and the additional information. What an interesting story. Stuart was the best man at my wedding . Eventually we lost touch and I was shocked to hear that he had passed away. Please have you any idea where his family is now as it would be great to get in touch again. I played football with Stuart who was a great guy! Hi John – Stuart’s widow Lynne stayed in the marital home for several years – I don’t know if she still lives there – he also had a son (James) and daughter (Laura) who have I think both married and got children.